1.Automatic control, simple and convenient operation, low failure rate. 2.Can be stand-alone operations, and also can be used with automatic packaging line. Motor and reducer and cam working which without adding oil, motor stop turn as soon as finishing bundling(save power). Strong compression and non-slip, teeth structure gluing, high strength cutting knife, good performance and long using life. Movement and control cover is whole die casting made by magaluma, never rust. Spare parts are made by computer numerical control machine tool, machine works soft, Excellence durability, prefer functions. Degree of tightness and belt reserve is adjustable freely. 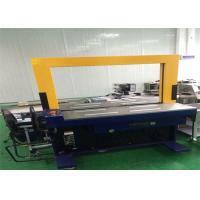 It is better to work with ultrathin belt, can save 30-50% cost. Electric parts: PCB, bolong motor, Autonics proximity switch, imported movement, China assemble.